It's already Decemberhow did that happen?! Just a minute ago, I was packing a U-Haul to take my son to his new apartment at college, and now I have to finalize my plans for Christmas before it's too late! As my calendar slowly fills for the month (company holiday party, nonprofit fundraiser, professional networking events, holiday celebration nights out with friends, dinner parties), and I save a few late nights for shopping, wrapping and baking, I wonder, when can I fit in Jesus? Despite attempts to try and simplify the celebrations that come with the weeks leading up to Christmas, the joyful, festive sights and sounds in the air make it difficult to be still and focus on what the whole world is celebrating. Any nonbeliever can tell you that Christians celebrate the birth of Jesus this season, but some may wonder what our cherished traditions around carols, extravagant decorations and Santa have to do with this mysterious holiday that is so grand that even the department stores get in on the act. A few years ago, I took the time to consider whether my deep love of family Christmas traditions, beautiful decorations, Christmas carols and festive gatherings of friends and family were just part of a meaningless lifelong routine or if they were in any way connected to my equally deep passion to honor the amazing gift to mankind, the Savior of my soulthe birth of Jesus, the Christ. The good news is I see the connection as clear as if the Star was shining over my head, and I hope that I am able to express the connection to all I encounter during this, my most favorite time of year. When I decorate my tree, each ornament tells a story, and I am reminded of the rich blessings I have through my family. As I trim the banister, I always take extra care to make sure my guests are greeted with enough sparkle to make them smile but also with a balance of serious sophistication to speak to the awe and humility I feel at the magnitude of this holiday. We have at least eight nativity scenes spread around the house to ensure a constant reminder of the big event. When I entertain over the Christmas season, it is to extend warm, joyful hospitality in hopes that my guests feel as loved as I do just because of Christmas. When I sing, I sing as loud as I can because I can't contain the joy that fills me with the familiar tunes and cherished words. When I shop, I take forever, because I want the recipient to see the personal touch behind the gift just like God, choosing an adorable baby to capture our attention. Christmas meals are served on the finest linens and china I have because I feel the presence of Jesus at the table with us. I secretly wonder sometimes why there is so much talk about the stress people find during the Christmas season because I approach it as if I am preparing to have the Son of God come to my house. And although I want everything to be perfect, I know that once the guest of honor arrives, I can just sit at his feet and soak in his presence. The last people that should be miserable at Christmas are Christians. If friends and family ask why you do so much to prepare for Christmas, consider telling them it's because the King of Glory is coming in a few days, and you want him to know how grateful you are that he choose you to come and save. We should be shining as brightly as the famous Star of Wonder, so that we too can lead others to the sweet baby Jesus, the greatest gift of all. The post Being Christian at Christmas appeared first on Today I Saw God. Does it matter if the Resurrection actuallyhappened? This was the question we considered in my adult Sunday school class at a church I used to belong to. I was a regular at Sunday school, where we considered issues of faith and its practice as a matter of course. Sunday school was organized and led by members of the church and always promised a lively discussion and discourse. But oneEaster Sunday, a bunch of us who came for the sunrise service and stayed to participate in the other morning services had gathered for Sunday school only to realize nothing had been planned. So a class member took charge asking the question of the day: Does it matter if the Resurrectionactuallyhappened? Our class leader didn't think so. "It's so unreasonable, unrealistic, so hard to believe," she argued. "My faith is in Jesus. If I follow him, that's enough. Whether or not he was actually raised from the dead doesn't matter." I found my heart oddly soured when nods of assent went around the circle. Wait a minute, that's Easter, this is Easter! I wanted to say. But I didn't because I couldn't. I couldn't justify my response or defend it against this rising tide of head nodders satisfied with the Son of Man who showedus the way. This man healed the sick, cast out demons, calmed storms, silenced his detractors and regularly attracted crowds. Isn't that enough? Well, no. Because if that was enough, he'd still be here, healing and casting and calming and teaching. But, and I think all authorities agree on this, he is not. There are no longer sightings of Jesus, the good man. He did die. And scripture tells us that when they went looking for him, Jesus wasn't where they put him. Word was, they were looking in the wrong place. He had gone to Galilee and would be receiving people there. Go and see. Easter, to me, is about the go and see. Could it be possible that a man has died and yet lives again? Not according to any textbook I've ever read. And not, apparently, according to my Sunday school leader. She was taking the safe approach: let's be satisfied with the Jesus we know. If we go looking for him as if he'd come back to life we might not find him, and then where would we be? The thing is, we need more than the tame Jesus we find believable. Now more than ever, we need Christ who is beyond belief. One who works miracles, walks on water and accepts death on its own terms so we can know there is life for us beyond the death of all that is un-good, un-kind, un-fair and un-godly in us. Christ died so we can know that those things in us are mortal; we can live without them. We are better without them. He came to show us that life.Not just in eternity, but now during this one. Last week I visited a historic site on the western coast of Florida called Historic Spanish Point. It was filled with the stories of ancient peoples and settlers enduring hardship and trials. The most recent inhabitants considered it sanctuary and rest. The grounds were alive with story and layer upon layer of meaning. The guide took us to see "Mary's Chapel," a tiny sanctuary that, in it's day, was open to all who might come. Next to the chapel was a centuries-old graveyard filled with headstones proclaiming the inhabitants, pioneers and patrons who had found a home here. Oddly intertwined among the headstones was a trunk sprouting a few brown and dying ferns. "That's the resurrection fern," our guide told us. "It looks dead, doesn't it? But in a few days, when the rains come, it will spring to life. Nobetter place to have a resurrection tree than in a graveyard, eh?" Oh my, yes. I'm so grateful there is such a tree in the graveyard of my life. The post Did the Resurrection Really Happen? appeared first on Today I Saw God. Jesus' life, from beginning to end, was beyond unexpected. Who knew that God would send his only son to be born in a manger? Who would have thought that this Messiah, this King of Kings, Lord of Lords, Counselor and Prince of Peace would live such a humble life and end up dying on a cross? Who could have guessed that the Savior would live as a servant and be resurrected? Who imagined that salvation would come to everyone who accepts Jesus as his or her savior? The more I think about Jesus' life, the more I am in awe of how vast God's love is toward us. God continues to show us ways to live in this world that are different than anything we ever expected. He reminds us that Jesus, this "Unexpected Messiah," is the living God who is with us right now, here on earth. Earlier this year, I was asked a question: "What is your most memorable Christmas and why?" At the time, I answered something simple, without much meaning, but the question stuck around in my head for a while. When I was looking for this year's Christmas cantata theme, Revelation chapters 4-5 caught my attention. This passage gives a vivid description of God's throne in heaven and the people who worship around it. It got me thinking about true worship and who or what we really worship for. I wanted to create a cantata that would reflect the true meaning of Christmas and provide a meaningful answer for the question "What is your most memorable Christmas?" Like most everyone else, I love the silly Christmas traditions that give you that warm, fuzzy feeling. I love old Christmas carols, apple cinnamon candles, beautifully decorated trees, wreaths, sweets, Christmas cards and giftsyou name it. But this year, I need to stop focusing on that Christmas feeling and spend more time thinking about the "reason for the season": Jesus Christ. Who is Jesus to me? Am I living as if I believe in Jesus? These are the questions I am asking myself for Christmas. This year's cantata will be a worship service full of adoration, praise, proclamation, confession and offering to the Messiah. It will send you forth full of inspiration to be the light of the world as God told us to be. And in the midst of difficult news around the world, it will remind us of the "Unexpected Messiah" who is with us always. This Christmas, I pray that we all get to worship the Messiah not by seeking out that warm, fuzzy feeling but by truly embracing the Holy Spirit and celebrating Jesus' unexpected life so that we can not only glorify him but also be empowered by his presence to become living examples of Christ in the world. I pray that people who are broken, lost, hurt and humbled can join us to experience the mystery of God's love and grace through Jesus Christ who came to us to be healed, saved, freed and lifted up. The post Unexpected Messiah appeared first on Today I Saw God. I find this beautiful quote from Teresa of Avila to be both inspirational and a bit intimidating. With all we are called to navigate in the world today, how do we live out this worthy but often demanding assignment? Perhaps we can begin to understand how to "be" Christ's hands and feet by considering how Jesus used his hands and feet when he was walking among us. Through the writers of scripture, we have a record of the way Jesus lived out his earthly existence, and these stories offer us clues on how we might continue his work. First, Jesus knew that he had to spend timewith the Fatherin order to know where to go and what to do next. Throughout the Gospels, we find that Jesus often "withdrew to a solitary place" in order to hear from his Heavenly Father.Even my most well-intentioned attempts to do God's will are useless unless I also regularly withdraw to a solitary place to listen to my Father. Through time in God's word, sharing my heart in prayer and being still enough to listen, I begin to glimpse the path that God has for me to follow to get involved in what he is doing in my little part of God's world. Without that time, I find I am often tilting at windmills. Secondly, Jesus was willing to be interrupted as he went about the work that the Father had given him to do. Most of the accounts of Jesus interacting with people and performing miracles begin with a phrase such as, "as Jesus went on from there." He was often traveling to another destination when someone approached him in need of healing. While his disciples sometimes tried to discourage or deter these seekers, Jesus always had time for the people who crossed his path. Jesus was all about relationships. In every instance, he made the choice tostop and offer healingand care to the persons involved.Because he was notoverly tied to his agenda of the moment, Jesus could attend to the higher purposes for which he was sent.In our own lives, we similarly have thechoice to view the unexpected, the unplanned and theinconvenient interruptions we encounter asprecious opportunities for connection and healing, divine appointments to realize our own role in bringinglove to a hurting world. Third, Jesus was willing to get his hands dirty. One of my favorite stories about Jesus is the time he chose to wash the feet of his disciples in order to teach them about being a servant.In their culture, washing dirty feet was the lowliest of jobs, yet Jesus got on his knees and tenderly washed and dried the dust-covered feet of those he loved most and then entreated them to do the same in his name. In fact, Jesus said clearly in John 13:15, "I have set you an example that you should do as I have done for you." As I seek to find the "important" work that I can do in God's kingdom, I sometimes overlook the opportunities for smaller acts of serviceacts that become holy when done from a place of love, grace and gratitude. Life is messy. People are complicated. Getting our hands dirty, literally or figuratively, requires a willingness to get involved in the middle of the mess and complications of being human and loving well. In prayer or in service, when I am on my knees, I am closest to Jesus. Finally, if we are to truly become Jesus' hands and feet, we must share his love for "the least of these." Jesus was revolutionary in his approach to the downtrodden and forgotten in his society. He touched lepers, he welcomed women and children, he dined with criminals, he championed the poor and he defended the powerless. Jesus spent his time on earth with the hated and the outcasts and claimed that he had come to "preach good news to the poor." If I want to be the hands and feet of Jesus, I have to open my eyes to the suffering in the world and allow my heart to be broken by those things that break the heart of the Father. Through the power of the Holy Spirit and a willingness to pay attention, we too can find ways and places where we can contribute to fixing what is broken in our world. Bottom line: we each can make a difference, and it matters that we try. God is at work in the world, and we can be part of it. We can be the hands and feet of Jesus! This post was originally published on Kelly's blog, "Grace Notes." The post The Hands and Feet of Jesus appeared first on Today I Saw God. What I did this morning has nothing and everything to do with stewardship. I did check the time – 4:00am. I did check the property – no trees down yet. But mostly I checked in with family. Two kids home. One kid at college – had an email from the University president assuring me of preparations being made to insure safety. Two dogs safely sleeping. But the husband, well, he was supposed to fly into Dulles around midnight. You guessed it – flight canceled. So he is driving from Charlotte as the winds and rain mount. I spent 2 hours, 49 minutes and 11 seconds, by my phone's count, on hold yesterday trying to reach a US Airway operator to see if we could get him booked on a flight that arrived closer to home. No go. "I'm sorry," the very sincere man with the island accent told to me, "Everything is full or canceled. We just can't control the storm." "It's okay," I said, "I only know one man who can do that. Thank you for trying." The guy chuckled as if he knew this man, too. 5:26am. Just got the text. My husband will be home shortly. I am feelingespeciallygrateful for such a simple thing: everyone is safe and accounted for. I pray it is so for you and yours today. Peace, in the storm. 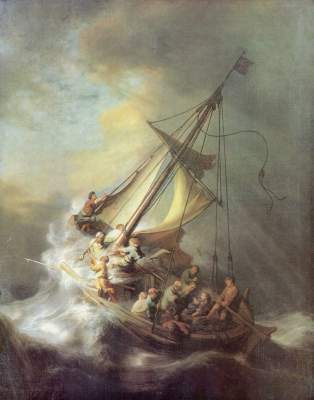 The post Sermon Response: Peace In the Storm ~ by Wendy LeBolt appeared first on Today I Saw God.